Dentures are very useful if you’ve lost all of your teeth. They allow you to eat and speak normally and give you back your beautiful smile. In some cases, it may take time to fully adjust to your new dentures. 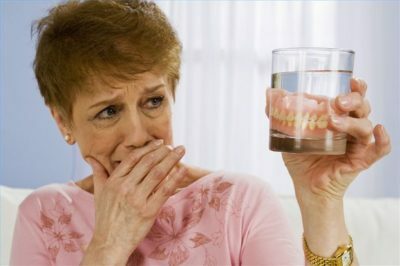 When you first start wearing your dentures, you may feel some irritation and soreness. This is not uncommon and should go away once your mouth adjusts to the dentures. You may also experience an increase in saliva production as your mouth becomes accustom to the foreign teeth. Another common complaint is that the dentures feel loose. Once the muscles in your tongue and cheeks strengthen, this loose feeling should go away. It will take time to get used to eating with your dentures. It’s important that you start with soft foods in small pieces. Chew slowly and on both sides to avoid tipping your dentures or shifting them out of alignment. You should start to introduce other foods when you feel comfortable, but be careful with hot and hard foods, which could damage your dentures. You may have some trouble pronouncing certain words. With repetition and some practice reading out loud, it will become easier. You may notice that your dentures make a clicking sound when you speak. To avoid this, try speaking more slowly. Your dentures may occasionally shift or slip when speaking, laughing, or coughing. To reposition them, bite down and swallow. You should schedule at least one follow-up appointment with your dentist. During this appointment, you can discuss any problems or pain you may be experiencing. In most cases, these problems will work themselves out over time, but if they continue, speak with your dentist.